This is truly a unique and fairly custom coop built by Dru from the Happy Coops in Fremont. Instead of tucking away the coop in the side yard, my coop and run fits exactly in a little heart shaped raised bed near the Douglas fir. Its visible right from the living room and as soon as you step out into the yard and has become beautifully blended with my backyard. The main hen-house, Coop de View as it is called, has a total floor space of 16 sq. 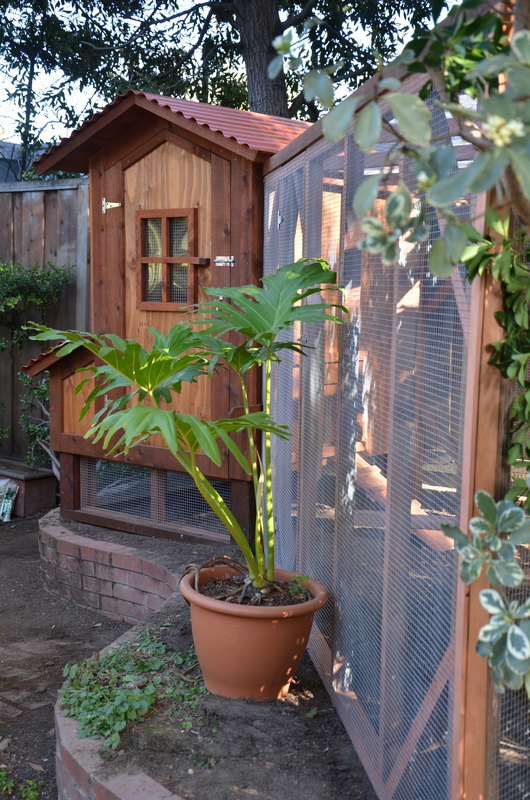 ft. or, 4′ by 4′ – with 32″ by 4′ dedicated to the roost area, while the remaining 16″ by 4′ is devoted to the nest boxes. The small window opens outwards and is covered with a strong hardware mesh. This is not your typical chicken wire, its much stronger. No predator could poke a hole in it! And as you know, Palo Alto is overrun with raccoons. The run area is a large triangle custom designed to fit the heart shaped raised bed and my two Barred Rocks and an Easter Egger are very much at home in their deluxe accommodations. A few interesting things about my coop and run. I use sand on the coop floor and straw in the nest boxes and can tell you all about how easy it is to clean on a weekly basis. Yup, weekly or bi-weekly, not daily! I also use straw in the run, following a deep litter method and so far its been working wonderfully well. This should provide me with tons of compost for next years garden. Ive also constructed my own tube feeder with a couple of ABS pipes and elbows. I can tell you all about this and much more, so do come by and visit! Lemonade, and some yummy treats.